Original Gay Head Light was installed in 1856. As the Gay Head Lighthouse begins its process of being relocated, there is a similar, if much smaller, move being prepared for down-Island. The original Gay Head lantern, manufactured in France and installed in 1856, will be moved from the Martha’s Vineyard Museum’s Edgartown location to the Marine Hospital in Vineyard Haven, where the museum plans to reopen in 2018. The Gay Head lantern is the oldest lantern from the oldest lighthouse on the Island. It sat atop the Gay Head Light in Aquinnah for nearly 100 years, until it was replaced in 1952. Something of a feat of engineering at the time, there have been fewer than 10 of its kind in the United States. 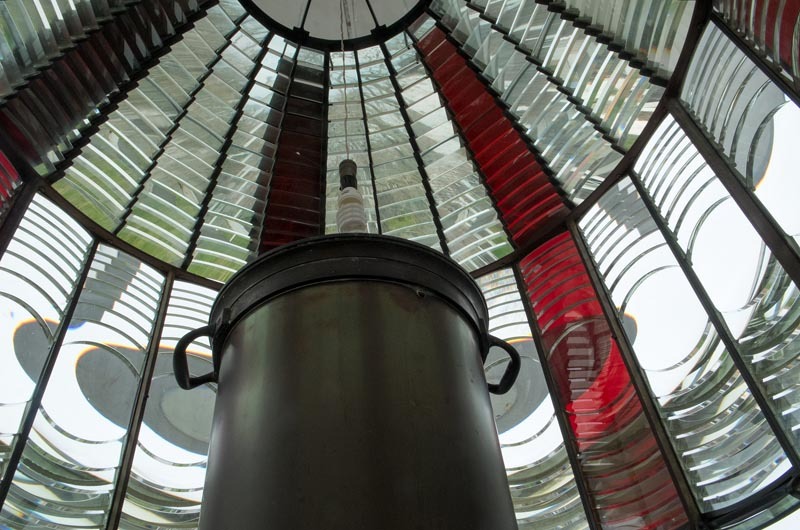 Jim Woodward, one of the country’s leading authorities on Fresnel lighthouse lenses, recently arrived on-Island to advise the museum on how to move and restore the centerpiece of its collection. Standing in the small brick building on the museum campus, Mr. Woodward looked up at the huge lantern, with its hundreds of curved prisms rippling up and down. Based on the work of the French engineer and physicist Augustin-Jean Fresnel (pronounced “Frenell”), the thick glass prisms refract light from a kerosene lamp, focusing it on a point 16 miles away. To ships at sea, it would have appeared much brighter than the current light, which is fully automated and consists of two electric lamps. Mr. Woodward, also known as the lighthouse guy, retired from the U.S. Coast Guard several years ago and now operates his own business, The Lighthouse Consultant, out of Green Valley, Ariz. 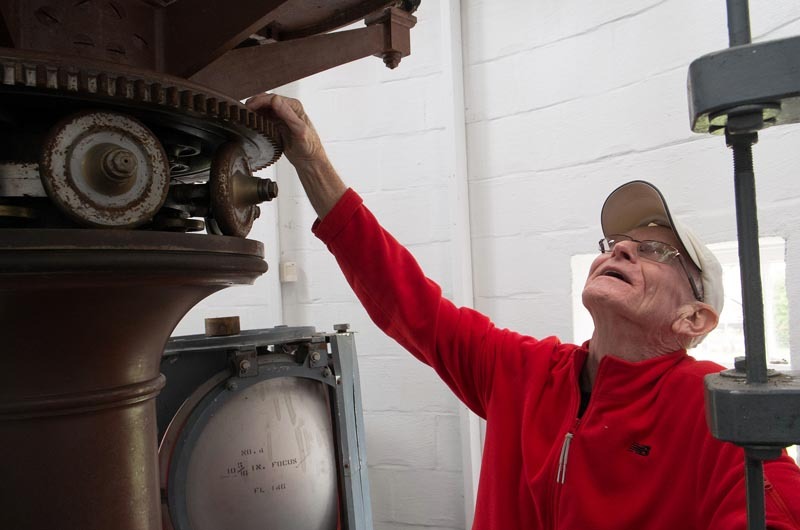 While there are no lighthouses in Arizona to speak of, Mr. Woodward worked in Cleveland, Ohio, for 44 years, removing and repairing lenses in the Great Lakes region (where there are lighthouses) and elsewhere. Museum curator Bonnie Stacy said the timing of the two lighthouse projects was “Absolutely a complete coincidence.” The evaluation of the moving costs and the conservation needs involved in the future will be supported by a $6,000 grant from the National Endowment for the Humanities, with the final proposal expected this spring. Mr. Woodward is not involved in the lighthouse relocation project, but he has worked with International Chimney, the company doing the lighthouse move, on many projects in the past, including the Buffalo Light in New York and the Cape Hatteras Light in North Carolina. 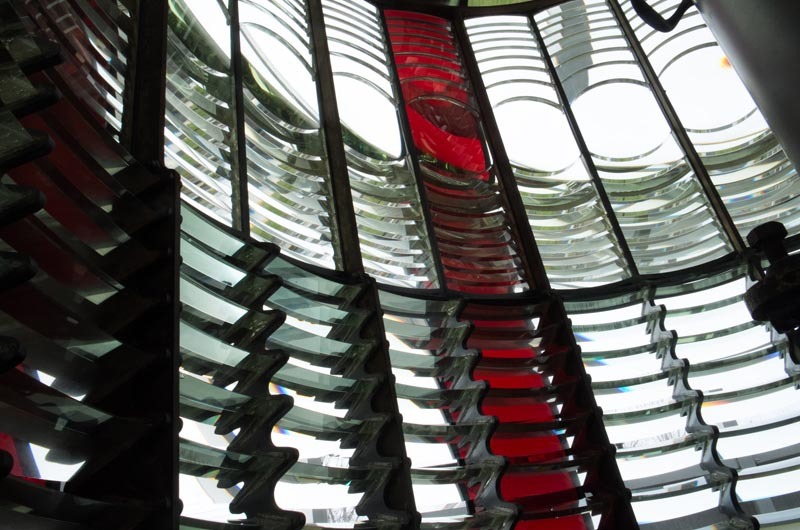 Given the age and fragility of the museum’s Fresnel lens, he didn’t think it would survive a 135-foot move at the top of a lighthouse. “The pedestal would be fine but the glass wouldn’t be so happy,” he said. The lens has 24 vertical panels, each holding a circular glass prism in the center, with eight curved prisms above and eight below in the middle section, and many more above and below those. Tall panes of red glass are positioned every four panels to create the white-white-white-red flash pattern. Ruby glass, as it was called, was created by adding gold to the molten glass. The ornate steel pedestal supporting the old Gay Head lantern was hoisted into place during the construction of the lighthouse in 1856. Mr. Woodward estimated that the entire structure, including the lens and pedestal, weighs between 3,000 and 4,000 pounds. At some point, the pedestal was given a coat of brown paint that is now peeling badly. The museum plans to restore it to its original color, following the discovery of a narrow strip of copper-green paint inside a small compartment in the lantern room. When the lenses were in use they had to be shaded from the sun, since the glass prisms would focus the sunlight directly onto the kerosene lamp. “You take all that sunlight and you focus it on a kerosene lamp, you have a bomb,” Mr. Woodward said. He was unaware of any mishaps at the Gay Head Light, but he did recall one episode on Lake Michigan where the light keeper forgot to close the shades. “He blew the lens right out of the lighthouse,” he said. A new building at the Marine Hospital will be designed with proper climate control, and will exist solely to showcase the lantern. The lens was moved to the museum shortly after the town of Gay Head became electrified. By then the Fresnel lenses were “ancient history,” Mr. Woodward said. “Virtually every light in the country had been electrified.” The Coast Guard had also been itching to replace the older, high-maintenance lenses with simpler technology. “It’s good that it came out in the ’50s because that was before military personnel started walking around with these great big key chains hanging on their belt loops,” Mr. Woodward said. “They would walk past the lens and just leave a string of chipped edges; they would think nothing of it.” Most other Fresnel lenses have at least some cracks, he said, while the Vineyard’s is remarkably well preserved. The Gay Head 10K is this weekend. Lighthouses define the character of Martha’s Vineyard.